"Starchitect" aka Star Architect, architect -branded designer buildings throughout Manhattan are changing the face of neighborhoods, lighting up the NYC skyline and turning apartments into Live-in Works of Art. Innovative designs, the move away from the standard cookie-cutter apartments, luxury service and views are attracting consumers that want everything taken care of for them. From valet parking, concierges, meditation gardens, infinity pools, electronically controlled sliding glass walls to restaurant service and room service. Recent record sales taking place around the city, a real estate trend that is breaking down the old neighborhood boundaries by allowing the new buildings to become destinations in and of themselves. From the glass Richard Meir buildings on the West Side Highway in the Far West Village to the Time Warner Center at Columbus Circle, they built destination buildings that created something that didn't exist before, and therefore set new pricing boundaries. The neighborhood is still important, but the buildings today are offering a lifestyle as well. The glass towers have a distinct 21st century look. Materials such as glass curtain walls, glass and stainless steel, glass cubes are as distinct to the new millenium as brownstone and limestone is to the 19th century. 21st century designed homes are offering luxury buyers a new alternative to the once more sought after charm, character and elegance associated with pre-war coops. Branding is an effective marketing tool for real estate developers, name brand architects and designers considered to be the 21st century architects and the next generation of urbanists from Phillip Johnson's Urban Glass House, Downtown by Phillipe Stark, Santiago Calatrava's 80 South Street glass and steel townhouses, glass cubes stacked on top of each other from a sculpture to Jade Jagger's Chelsea Living "PODS" are creating a buzz and demand for their brand name buildings. New luxury condos with new park views are going up in Chelsea around the The High Line. 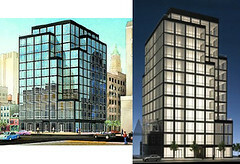 The Caledonia, the first luxury condominium tower on the High Line will be completed Fall 2008. The High Line runs through three of Manhattan's most dynamic neighborhoods, Hells Kitchen, West Chelsea and the Meat Packing District. New apartments are planned along the elevated 22-block park the High Line is to become. The High Line a 6.7 acre span of former abandoned elevated train track running 22 blocks that is being transformed into an open agri-tectural park. The 21st Century Central Park. The luxury apartment house was actually invented in New York in the late 19th century. Upper-class New Yorkers lived in townhouses and single-family mansions during the 19th century. By 1930, 90% percent of Manhattanites lived in apartments. To lure potential tenants, developers borrowed the word "apartment" from the French to make the new buildings sound more fashionable. The word and the lifestyle stuck. 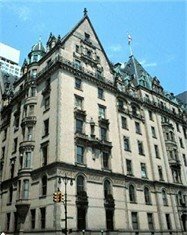 In 1890 The Dakota was the first luxury apartment building in Manhattan. It's Beaux Art style architecture was popular in the late 19th century. In 1904 The Ansonia was called the most technologically advanced apartment house in the world. Apartment house living spread from New York to the rest of the country. After World War II the New York apartment buildings became flat panels of brick and glass, lacking shape, color, texture, and ornamants. To recieve new listings by email click here. Jade Jagger and the Chelsea Living Pods...see everytime you post there is something I wind up investigating because it's intriguing. Have to go find photos now..........good post! Here is a picture. We have pods in my office it's High tech for cubicle. Jade's Pods start at $530,000 for 424 s.f. pod up to $3.750,000 for 1822 s.f. pod. This is a Gen Y thing. Converted to Condominium in 2007. New condominium conversion designer by Jade Jagger, Mick's daughter. Thank you, Mitchell! No wonder I couldn't find them when I googled condos and Jade Jagger lolol. These look pretty cool for cubicles, a far cry from the old Steelcase stuff (sturdy as it was). Course the price tag matches her last name and the hipness of it. Thank you I can live variously in Manhattan through you! These "pods" do look pretty cool, like high tech murphy beds. Maybe someone will call that wants to buy one. This is a fairly sneaky but successful way to get me to read all your blogs....I am stopping for the moment after having read the one that appears to be in Chelsea and has mahogany stairs and used to have Robert Downey Jr (hubba hubba lol). That apartment sounds wonderful.....that blog post is called 1981 not 1989 so apparently I have more to read....after I finish my stir fry!! Love Murphy beds. Never really understood why they went out of favor. I sleep on a futon but think a Murphy bed much more attractive and out of the way for guests. Just my opinion! 1981 Robert Downey Jr. (50 w 86th St.) it's the Upper West Side, Actually It was Tom Cruise in '81 Robert Downey Jr moved in around '85. Chelsea was not chic and trendy in 1981. It was pretty rough. Several years ago I got a listing in Chelsea. It was a cute studio, my seller was as sweet as could be she was moving to Brooklyn. When I got there she had bars on the windows. I said what's with bars - they have to come off. She said I moved here 14 years ago this was a rough neighborhood - it wasn't always chic. She told me there were cop chases on her fire escape every night when she first moved to Chelsea. Back then the upper west side was just starting to become gentrified. My parents thought I was living in West Side Story. The Upper East side was the posh neighborhood back then. And thanks, I re-looked at the map and saw my faux pas about where the place is....it looks lovely! Thanks for being so descriptive your clients and any consumers who read this are very lucky! Mitchell, I hope you had a fabulous Thanksgiving weekend (which is still not over so keep enjoying it). I took time to read all of the historical posts on Manhattan real estate and you really capture the architecture and 'feel' of the neighborhoods and styles. I can see why your clients work with you! This last post is fabulous. Carole, Thank you. I've been adding to it. I'm about to write a new blog about living in Landmarks - not landmark apartment buildings like the Dakota and Ansonia but landmark banks and factories and other buildings that have been and are being converted into apartments. Thanks Tommy glad you like them.